Directions: Preheat the over to 375 degrees. Cut the zucchini’s in half lengthwise, remove the seeds and pulp and set it aside. Heat up the olive oil or coconut oil in a cast iron skillet or a frying pan on medium. Sauté the onion and garlic for several minutes or until the onion starts to become translucent. Add the grass fed ground beef and mix around. Sauté the beef until it is no longer pink, than add all of the toasted spices and well as the salt and pepper and mix together. Cook for a few more minutes before adding all of the chopped fresh herbs. Set some of the chopped basil aside for the garnish. 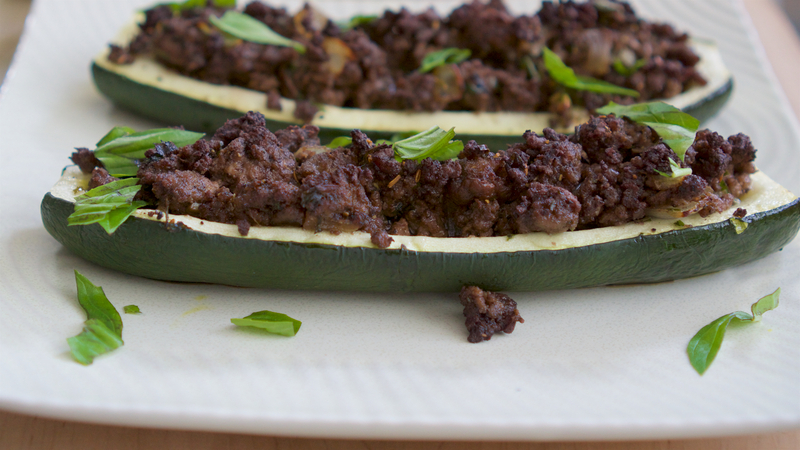 Turn off the heat and spoon the beef mixture into the zucchini. Place the stuffed zucchini on a baking dish, drizzle with olive oil (optional) and bake for 20 minutes or until the zucchini is tender. Set on a plate and garnish with the remaining fresh basil. Toasting the spices: Put a small frying pan on medium heat and slowly toast the cumin, fennel, cloves, coriander and allspice. Stir slowly with a wooden spoon and lightly shake the pan. When the spices start to become very fragrant, they are done. It will only take a few minutes. Transfer the spices into mortar and grind them into a powder.